Rebecca Gilbert of Stumptown Printers has been at the heart of Portland’s independent publishing scene for over a decade. 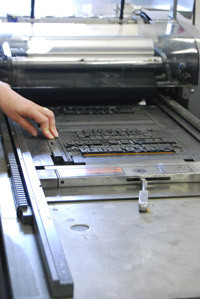 Standing in the cavernous, 4,500-square-foot shop letterpress and print shop Stumptown Printers, the clickity clack of presses creates an intoxicating rhythm. The oily smell of ink draws visitors in further, while the vibrant collection of posters produced by this co-operative becomes a feast for the eyes. 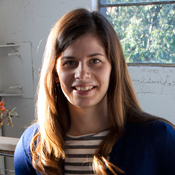 Stumptown Printers is not your typical print shop and PNCA alumna Rebecca Gilbert, one of its founders, is not your typical entrepreneur. The Vermont native has spent the better part of her post-PNCA years at the helm of Stumptown Printers, the go-to printing company for musicians (hometown heroes, the Decemberists, among them) seeking environmental responsibility and Portland aesthetics in their CD packaging and promotional materials. Over the last 10 years, she also founded and directed the Independent Publishing Resource Center (IPRC), a nonprofit for zine publishers and artists. “I’ve been working a lot. That’s a good thing, right?” she says, smiling. 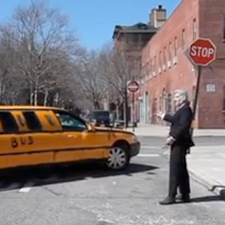 “Gosh, I think I’ve only been to visit the school four times since I finished in late 1996. Where has the time gone?” She spent her freshman year at Humboldt State University in Northern California, but transferred to PNCA after her sophomore year. 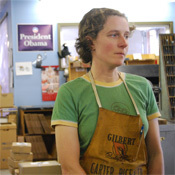 Drawn to PNCA for its independent study program, Gilbert immersed herself in letterpress printing and bookbinding (she took these courses at the Oregon College of Arts and Craft through its partnership with the College) and also pursued a professional internship. “I had always been really into typography,” says Gilbert, who interned with PNCA alum Pete McCracken, ’95 at Crack Press, where she learned the nuances of digital font and type design. “Working with Pete, I found myself referencing the physical type, or those carved by hand and cast in metal, quite a lot,” she says. 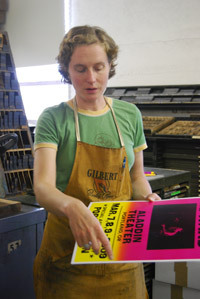 Upon completion of her BFA, Gilbert did typography work at various businesses around Portland, including Powells.com and the L&B Studios run by PNCA alumni Mark Bornowski ’83 and Marguerite Leon ’85 while also taking on her proudest accomplishment—establishing the Independent Publishing Resource Center (IPRC). 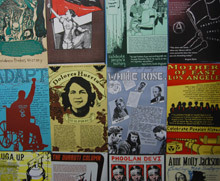 Founded in 1998, the IPRC filled what Gilbert called “a major void” in the late 1990’s, a time she says saw a flurry of interest in independent publishing. Largely inspired by her senior thesis project— guiding at-risk high school students in Southeast Portland through the writing, publishing and binding of their own anthology of creative writing— Gilbert sought to move publishing out of the hands of the few and into the community. “Working with students, I saw firsthand how being an author gives one the power to contribute to the subjective history of our culture,” she says. The IPRC, which is headquartered on Oak Street near Burnside, is now the heart of Portland’s independent publishing scene, offering workshops, studio space and resources for self-publishers. “Over the years, Rebecca’s incredibly precise technical skill, combined with her passion for the art of letterpress, has inspired so many hundreds of folks to get into printing and self-publishing,” says Justin Hocking, IPRC’s executive director. 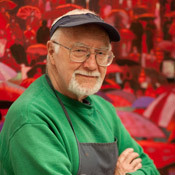 In 1999, Gilbert partnered with brothers and local musicians Eric and Brian Bagdonas to launch a printing studio in the corner of a Southeast Portland warehouse. Employing the city’s reliable word-of-mouth approach to advertising, the crew, which named itself Stumptown Printers, worked at night and on weekends to build a client base—one that quickly flourished into a web of connections within the music community. Stumptown prides itself on using vegetable-based inks and alcohol-free dampening systems and creating recyclable event posters and non-“jewel-case” CD packaging. Gilbert says that around 70 percent of their current clients are from out-of-town, many in Europe where the dollar is strong, and that a typical order or “run” of CD packaging units hovers at 1,000 or 2,000 (though the company recently went into overdrive to fulfill a 30,000-unit order for the re-release of Juno songwriter and Olympia native Kimya Dawson’s debut album).